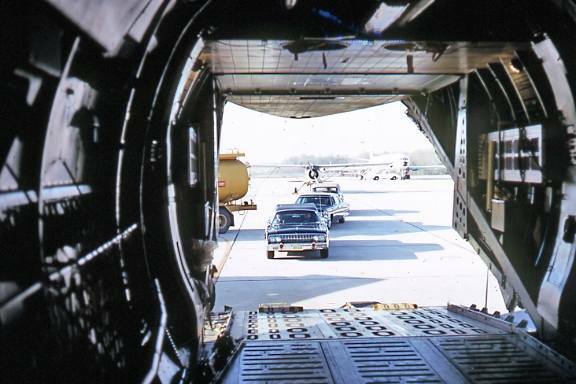 'What's the strangest cargo you ever carried in the C-141 Captain?' I was once asked at an Armed Forces Day static display. Standing in the shade of the open clamshell doors, I thought back and chuckled to myself 'If you only knew friend, if you only knew'! I gave him an abbreviated answer and that must have satisfied him. That was early in my 141 experience, a Captain in the 20th MAS, Stationed at Dover AFB Delaware. I can answer the question much better now almost 40 yrs later, looking back at the whole picture. Remember I was in the powerful little Model A. I KNOW you guys that flew the stretch have some even better stories. If it came to a contest and vote I would have to go with the 141 wing stuffed into the 141! Being able to carry your own replacement wing along with you, now that's class! One of my first trips from Dover was in April 67 direct to Andrews AFB in MD. The load was 3 cars. 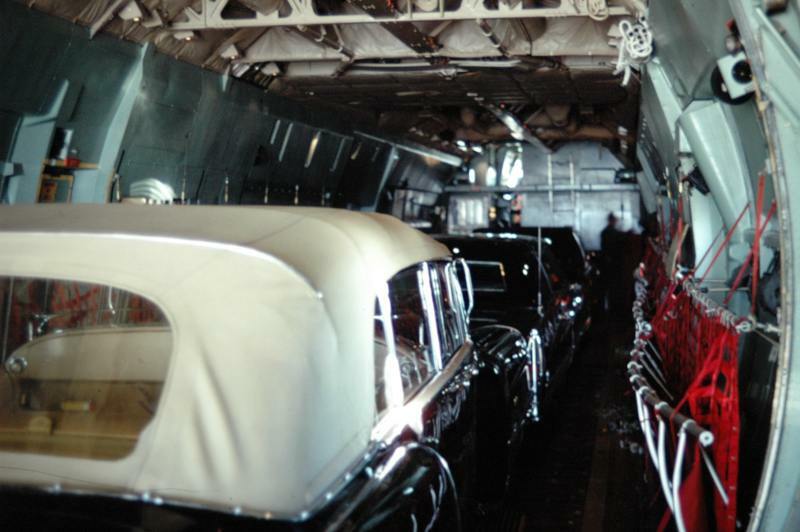 German Chancellor Adenauer had died, and these were President Johnson's cars for the funeral procession in Germany. 38,000 pounds of cars! Some other misc. items like; jerry cans of fuel, food for the entire trip and two mattresses to sleep on, completed the load. Ford and GM were both represented. The first onboard was the big Lincoln sedan. All of them had huge self-sealing tires and five-ply windows, which helps explain why they each weighed in at 12,000 lbs. The second was the black Caddie sedan, followed by my favorite; an older tan Cadillac 4-door-convertible with running boards. You new guys, ask your father about running boards. 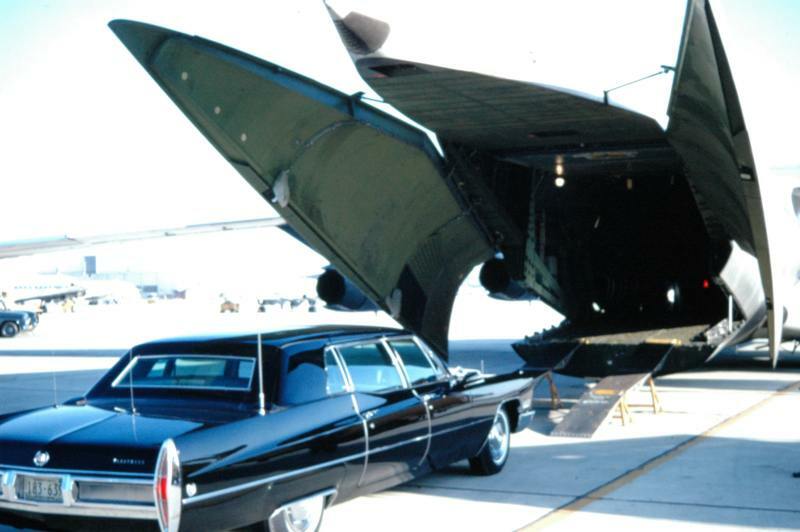 And, as with ALL the really special stuff we ever hauled, this cargo came with guards; four secret service, with automatic weapons for good measure. In 1967 or 1968 something must have been going on in the financial markets overseas and I think our good old Uncle Sam was helping out. The pick up was GOLD. I'm sorry I don't remember whether it was in VA, MD, or KY that we loaded the crates. Onto the floor or onto pallets I can't remember. I only remember the details about the 24'X 24' X 12' crates made of 1'x5' fir boards, closely placed (so-no peeking), that took 4 strong guys to lift! I don't believe that was a 35,000 pounder, I think it was only a 16 or 18,000 pound load, going to Mildenhal, England. My calculator was working. IF the price of gold was $250 an ounce. then, the 16,000 pounds of it would have been 64 million + or minus! MAN! OF COURSE, accompanying us were four (4) 'hombres' with Thompson machine guns. OF COURSE, after heading out over the pond, we were debating - South America, or Canada for a 10 way split. Let's see, accounting for some 'spillage' in the crash landing that would be……OF COURSE we knew better! Offload in England was surreptitious, in the trees, in the dark, and spirited away, quickly. I think in the more recent years, airdrops, were practiced more, and even more widely accomplished. Maybe everyone had the weirdo's, like one dropped on us out of Elmendorf. On your way home, take these ten guys up north and let 'em jump out into the cold dark night from 9,000 feet, OK? OK. Coo-coo. Talking about weirdo's, U.S. pick-up, two guards M-16s, a plane load of barrels, like 55gal drums only taller, liquid-filled, with loose covers, AND, get this-- wires coming out of each barrel connected to a gauge? This load comes with a DD175 entry and very remote parking. What's to worry? We made it didn't we? THE BEST load was two StarFighters, in the belly of the Starlifter. How's that for poetry by Lockheed! Four 8 foot wings crated along the side walls, and that's it. Except for -the guards. THEY claimed the Gatling guns were loaded. I always wondered…..
Maybe these tales will jog your memories a little. We all had real adventures with the C-141 didn't we? We can't leave here yet without speaking about the place in our heart for the air evac missions we flew. The nurses who tended ship and the service we provided were certainly unique. Seldom did I hear complaints of the load being late or because of delays loading patients. The crews I worked with were outstanding. The empathy they showed our wounded comrades was heartwarming. The C-141 air evac mission had to be a quantum leap forward in our ability to get the wounded stateside for treatment. Finishing the unique cargo script is the tale told me by Sgt. S. Litchfield, Flight Engineer on one of the last C-141's out of Saigon. Any of our Vietnamese allies that were left in Saigon were surely condemned to death after our withdrawal. So Herculean has to be the label attached to the effort to get EVERYONE OUT! Six hundred to eight hundred souls on the last two flights out of Saigon, says it all for the crews and the machine C-141.